Israeli forces go on high alert in anticipation of mass demonstrations, sealing off swaths of territory and tightening restrictions on entering a flashpoint holy site as Palestinians and Arabs prepare for a day of marches throughout the region. Israeli forces went on high alert in anticipation of mass demonstrations Friday, sealing off swaths of territory and tightening restrictions on entering a flashpoint holy site as Palestinians and Arabs prepared for a day of marches throughout the region. The Land Day rallies are an annual event marked by Israeli Arabs and Palestinians in the West Bank and Gaza who protest what they say are discriminatory Israeli land policies. Supporters in neighbouring Arab countries are also planning marches near Israel's borders in solidarity events. Similar demonstrations turned deadly last year, and thousands of Israeli troops and police were deployed Friday in anticipation of possible violence. Many Palestinians, energized by Arab Spring uprisings that have overturned decades-old regimes, see massive, co-ordinated marches as one of the most effective strategies to draw attention to their cause. "After the Arab revolutions, there's awareness of the importance of popular participation," said a prominent Arab activist, Jafar Farah. "This has rattled the Arab regimes, and now it's frightening the Israeli government." Israel's military closed off the West Bank to all but humanitarian emergencies, saying the move was "in accordance with security assessments." The West Bank is a hilly territory on Israel's eastern border where over 2.5 million Palestinians live, alongside hundreds of thousands of Israeli Jewish settlers. The closure will not apply to the settlers. Police also restricted access to the Al-Aqsa Mosque compound in Jerusalem, Islam's third holiest site and a frequent flashpoint for Palestinian-Israeli violence. Police spokesman Micky Rosenfeld said only men over 40 years of age may enter the compound, while women may freely do so. The age restriction applies to Palestinians from Jerusalem who carry residency permits, and for West Bank Palestinians — though few of them are expected to be allowed into the city because of the military's closure of the territory. Israeli-Arab citizens, regardless of age, will be allowed to enter, Rosenfeld said. Thousands more policemen were deployed into northern Israel, where Israel's Arab citizens are expected to hold a large demonstration in the village of Deir Hanna. 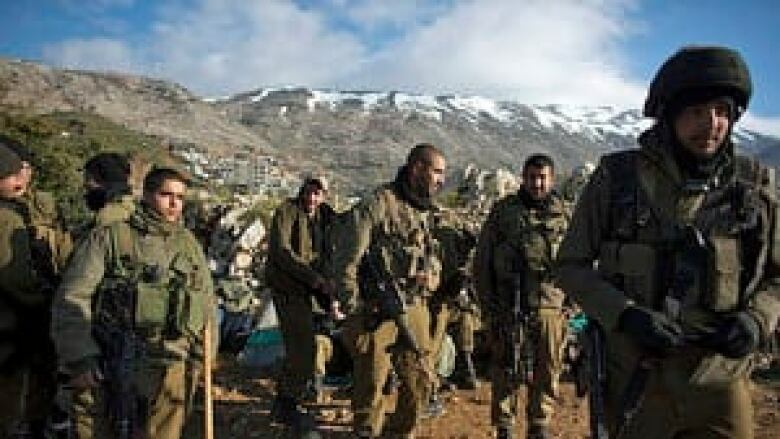 Israel was also preparing for possible trouble along the borders with Lebanon and Syria in the north, Jordan to the east, and Egypt and the Hamas-controlled Gaza Strip to the south. Mahmoud Aloul, a Palestinian leader in the West Bank involved in the marches, said Friday's demonstrations were to be held in Jerusalem, the Qalandiya checkpoint — a frequent flashpoint of violence on the outskirts of Jerusalem — and in the West Bank town of Bethlehem. While organizers said Friday's marches would be nonviolent, similar protests last year turned deadly. At least 15 people were killed in clashes with Israeli soldiers when they tried to cross the Syrian and Lebanese borders with Israel in a May protest marking Palestinian sorrow over Israel's creation in 1948. A month later, 23 demonstrators were killed. The demonstrators had crossed into the no-man's land between Israel and Syria in a demonstration against Israel's control of the Golan Heights, captured from Syria in the 1967 Middle East war. Activists in Gaza planned to hold a demonstration about half a mile from the Israeli border, but said they did not plan to move closer, minimizing the chance of clashes. Likewise, authorities in Lebanon and Jordan said they would keep demonstrators far from the Israeli border. Several thousand protesters were expected in each place. It was not clear whether protesters would gather in Syria, which is in the midst of an anti-regime uprising that has killed thousands. Land Day commemorates an event in 1976, when Israeli Arab protests against land confiscation turned deadly. Since then, it has been used as a rallying cry for Israeli Arabs and Palestinians to highlight what they say are Israel's discriminatory policies that have seen their lands confiscated in Israel and in the West Bank, mostly to be utilized by Jewish Israelis.